Join us for the annual Summer Fete which features games, entertainment, shopping, food, and something for all the family from 12-4pm. This popular community event brings together students, staff and visitors galore to enjoy a traditional day of summer fun. The fete takes place in the college’s commercial outlets offering home-made breads, cakes, jams, chutneys and plants to buy from the Garden Centre and shop. Food, including a children’s menu, will be served in the college’s Orangery Restaurant and Garden Café from 11.30am-4pm. 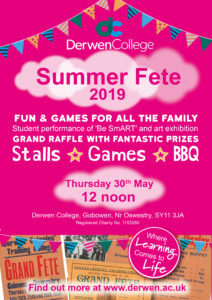 Other highlights include a performance of ‘Be SmART’ by Creative Arts students, an art exhibition and a grand raffle with a host of fabulous prizes.